If you haven’t picked up the new issue of Martha Stewart Living go pick it up now! Featured in this month’s issue are some of the brillant designers that work in the crafts department. 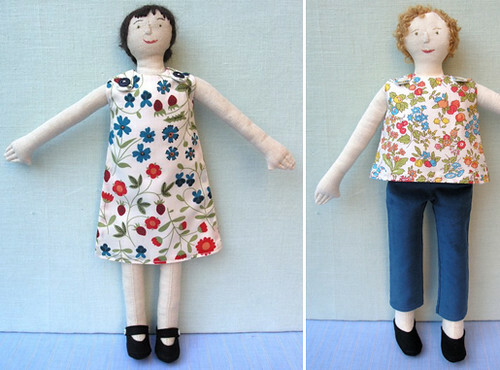 Lauren Normandin makes these adorable handmade dolls and crotched flower hair pins. She sells her amazing crafts on etsy.com or follow her crafting adventurous on her blog. When I was cruising around her main website, wrenhandmade.com I found an amazing section of artwork by Lauren. She is one crafty girl. Don’t miss her crochet section on her blog. I love the necklaces, pillows, hair pins. I could go on and on. Everything is so cute! Thank you for being a crafty genius Lauren! So inspiring. p.s. Lauren was recently laid off from Martha Stewart after 11 years in the crafts department. urg publishing. Let’s help support her in all her future creative endeavours. I love the flower pins for little girls!